"As difficult as it can be," says the Archbishop of Portland, Oregon, "and as much of a cross it might be for us at a time in our life, God’s grace enables us to overcome our struggles, even with sin." 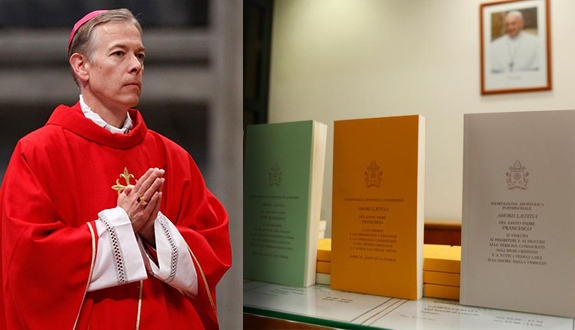 During the first week of October, His Excellency Archbishop Alexander K. Sample of Portland, Oregon, issued “A True and Living Icon”, a 13-page “Pastoral Letter on the Reading of Amoris Laetitia in Light of Church Teaching”. While addressed to the “Priests, Deacons, Religious and Faith” of the Archdiocese of Portland, the letter has garnered significant attention beyond western Oregon. Archbishop Sample graciously responded, via e-mail, to several questions about his letter. Below is the full interview. CWR: What was the main reasons for this pastoral letter at this time? Were there specific questions being raised within the Archdiocese, or did you anticipate certain questions and situations based on events outside of the Archdiocese? Archbishop Alexander K. Sample: When Amoris Laetitia was first released, I indicated that we all needed time to read and reflect on our Holy Father’s message before making practical application here in the Archdiocese of Portland. I myself needed time to digest the content before responding. I was also surprised by how the Exhortation of Pope Francis was being misused in some circles in ways that were not consistent with the perennial teaching of the Church. I said at the time of its release that I would follow up at some point with further guidance. We had our annual convocation of priests, and I believed it to be the right time to share my guidance with them before releasing it to the wider Archdiocese. CWR: Your letter opens with a strong emphasis on the Trinitarian and Christocentric foundations of the Church’s teaching about marriage and family. Do you think those foundational truths need to be better emphasized and understood? Put another way, how much of the confusion and controversy surrounding the Church’s teaching on marriage is rooted in lacking understanding of what She teaches about God as Trinity and Jesus Christ as Lord and Savior? Archbishop Sample: This is precisely the point. I am afraid that we continue to reap the bad fruit of decades now of poor catechesis on the very nature of marriage and family life. How else can we explain the acceptance of a redefinition of marriage on the part of so many Catholics? A proper and sound theological basis for our understanding of marriage must precede any pastoral efforts to strengthen and help marriages. Marriage comes from the hand of the Creator, and we must understand it in the light of this revelation and even the natural law dimension of the marital covenant. Marriage and family reflect the inner life of the Holy Trinity as a communion of persons. It also reflects the permanent and indissoluble covenant Christ has entered into with us through the blood of his cross. CWR: “Social contexts do not cause human nature or the human good;” you write, “indeed, only an invariant human good allows us to understand the idea of moral development within human history.” Is this, in many ways, the central issue at hand today when it comes to gender ideology, homosexuality, and sexuality in general? How can Catholics better present and explain the Church’s rich teaching about anthropology and the meaning of human existence? Archbishop Sample:This is a serious challenge that the Church must take up with confidence and a renewed vigor. It is very difficult to have a discussion within the Church and with the wider community of society if we cannot even agree on the essential nature of the human person as he or she comes from the hand of the Creator. We are created in the image and likeness of God and exist according to his plan. We cannot define who we are. God has already done that. It is up to us to humbly accept the nature that he has given to us while helping those who are confused to discover this truth which ultimately brings true happiness and freedom. This education, for our own Catholic people, has to start in the family itself and from the very earliest levels of education in our Catholic schools and faith formation programs. CWR: Your focus is on “troublesome misuses” of Amoris Laetitia, and you look in detail at three such misuses. What are the sources of these misuses and why are they apparently so prevalent today? Archbishop Sample: In many ways my pastoral letter is a re-presentation of some aspects of our Catholic moral tradition, rooted in Sacred Scripture and developed throughout the centuries by the Magisterium guided by the Holy Spirit. Again, we are reaping the ill fruits of decades of confusion on the morality of human actions. Some have sought to capitalize on this confusion by continuing to offer moral analysis that is not consistent with this sacred Tradition. Pope St. John Paul II sought to clarify these erroneous understandings in his monumental papal encyclical Veritatis Splendor. That is why I rely heavily on his teaching in my own pastoral letter. CWR: The second misuse addressed is the notion that “Under Certain Conditions Divine Prohibitions Admit of Exceptions”, and you make a clear distinction, drawing on St. John Paul II, between the positive commandments and the negative commandments. Why is that distinction so significant? Archbishop Sample: Because by following the divine commandments we achieve our true happiness both in this present life, but more importantly in eternity. God commands us to do good and avoid evil, simply put. God gives us the positive commandment to do good, for example by living the Beatitudes and the corporal and spiritual works of mercy. But an individual’s obligation in this regard can vary from one to another, depending on one’s own state in life and personal circumstances. In other words, there is room for individual responses to these positive commands. But negative commandments, the “Thou shall not” commandments admit of no exceptions in the objective. Generally speaking, no one is forced to act in an evil manner against the commandments of God. One’s personal culpability for sinful actions can be diminished, or even eliminated, if acting out of inculpable ignorance or without full freedom, but the divine negative command still applies in all circumstances. This is an important point that we must be clear about. We must help and accompany those who do not fully live up to this moral obligation. This can happen gradually in a person’s life, but that does not mean that the divine command gradually applies. It always applies. CWR: The third misuse is the incorrect belief that “Human Frailty Exempts from Divine Command”, and it touches on something that seems to be, so to speak, “in the water”: the assumption that God’s grace really might not be sufficient for everyone or for every situation. How are the current confusions informed by this failure of faith? Archbishop Sample: We must be reminded of St. Paul’s own struggle with the “thorn in the flesh”, whatever that might have been. He struggled and begged God to remove this from his life. The Lord responded with an assurance that his grace would be enough for St. Paul. We do not know if St. Paul was specifically struggling with sin or sinful temptations, but nevertheless, do we believe that God’s grace is sufficient in our own struggles with sin? Speaking for myself, I believe and know that to be true. God does not ask of us the impossible. As difficult as it can be, and as much of a cross it might be for us at a time in our life, God’s grace enables us to overcome our struggles, even with sin. If we don’t believe this, then we are doomed to despair and are lost in the darkness. That is the heart of God’s mercy shown to us in the passion, death and resurrection of Jesus Christ our Savior. We must believe and trust in the grace of his mercy and love. We must help those who struggle to believe that their lives can indeed be transformed by the cross of Christ and the power of God’s grace. CWR: What sort of responses have you received so far to the letter? Archbishop Sample: For the most part the response has been very positive. I have received many supportive messages from laity, priests and even some of my brother bishops. Of course there will always be detractors, but that must never stop us from proclaiming the fullness of God’s mercy rooted in the truth he has revealed to us.